The Undead army was first seen after dark, the soldiers' and knights' fleshless bones glowing in the moonlight, the banshee's shriek echoing throughout the countryside. Peasants screamed and hid in their homes, and even the Citadel Guards found their knees trembling as they watched the stream of armed skeletons flowing towards the city. How could they defeat an army of creatures who were already dead? 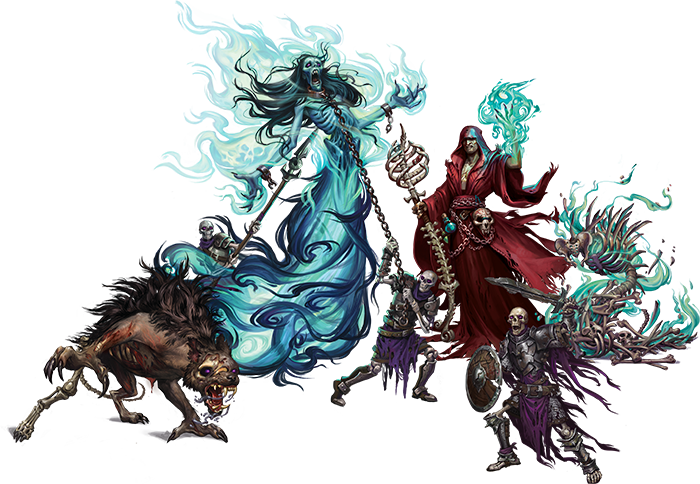 Fantasy Flight Games is proud to announce Terrors of the Mists and Heralds of Dreadfall, two army pack expansions that introduce the new Undead faction to BattleLore Second Edition. Long ago a wrathful and corrupt general, Waiqar, led an army against a great, noble mage in battle and was soundly beaten. At the moment of defeat, Waiqar vowed that neither he nor his men would rest until they had conquered the mage. But this vow was so filled with hatred that it became a curse, dooming Waiqar and his men to eternal, living death. Since that time, Waiqar has amassed a gargantuan army of Undead creatures, including numberless spirits that never served him in life. 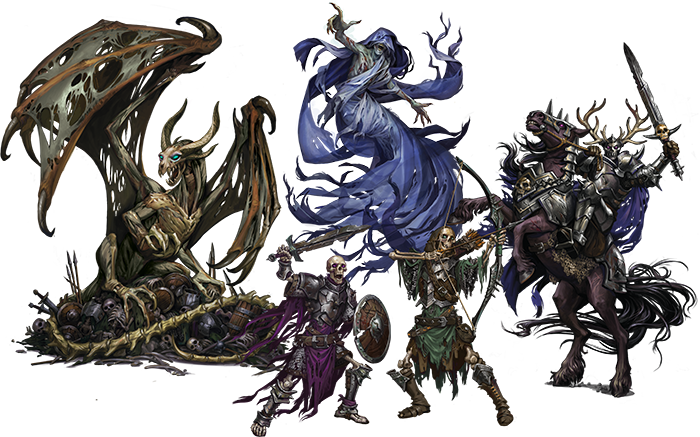 Now the Undead are bringing ruinous horror to the realm of Terrinoth and transforming the game of BattleLore. In each of these Army Pack expansions you’ll find five different units and more than enough forces to compose a fifty-point army. Full twenty-card lore decks magnify the horrible powers of these restless armies while new scenario cards and terrain tiles turn the battlefield into a grave-strewn wasteland. Whether you lead them against the stalwart and noble Daqan Lords or the demonic, bloodthirsty Uthuk Y’llan, your Undead armies are terrifying and implacable force of war. Creeping Bone Horrors and Reanimates emerge from their mist-shrouded graves to attack the living in Terrors of the Mists. Piles of disordered, fleshless bones bound together and animated by a vengeful, once-human spirit, Bone Horrors are unyielding and incapable of retreat. Sword-wielding Reanimates are decaying skeletons filled with the cursed essence of defeated soldiers. They still retain their human form but, being already dead, easily recover from damaging blows. Commanding your legions of these two Minion units are sinister Necromancers wielding deadly combat magic. These Necromancers are the only mortal servants of Waiqar the Undying, persuaded to fight for him by promises of incredible power. Fighting alongside these humans and once-human creatures are prowling Barghests – monstrous and evil canines who exist to prey on the living – and a ghastly Banshee who has haunted graveyards since the dawn of time. The mere howl of a Barghest can Panic living fighters so that they suffer damage when trying to force others to retreat. The chained, shrieking Banshee is so horrifying that she drives her living foes away in terror. With a combat value of four, she is also easily able to defeat those few warriors who overcome their fear enough to engage with her. As always in BattleLore, you can combine these units to create a custom deployment for the battle before you or use one of the two included army cards to shape your army. The Terrors of the Mists army features three units of Reanimates and Bone Horrors driven by three units of Necromancers. The Banshee and a unit of Barghests follow upon the heels of these shambling hordes to combat your enemy’s most powerful units and spread terror throughout the battlefield. Even more Undead units take up arms in Heralds of Dreadfall. Grinning Skeleton Archers stand alongside Reanimates in the front lines and fire blighted arrows at your foes. A blighted unit only moves one hex at a time and becomes weak, less likely to deal damage in an attack. Joining ruthless walking corpses is a vicious, grave-haunting dragon, the Barrow Wyrm, who can blight enemy units with its Plague Breath in order to more easily eliminate them and harvest lore from their dissipating spirits. Similarly, you can establish a hex of Plagueland terrain, where living forces become blighted but Undead units grow only more lethal. Unlike the shambling Bone Horrors and Reanimates that are constructed from the remnants of recent corpses, the Death Knights have fought with Waiqar since both he and they were living flesh and blood. 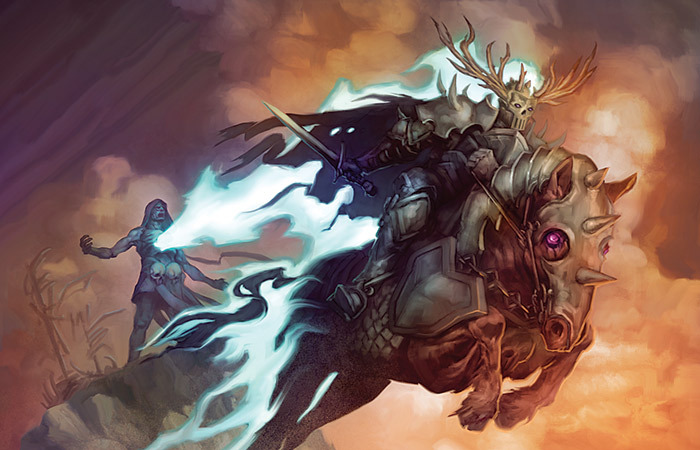 With a combat value of four, the Death Knights are the most powerful cavalry in all of BattleLore, so terrifying that weak units cannot even attack these ruthless horsemen. Wraiths are equally difficult to assault. These disembodied, ethereal creatures are difficult to harm with physical weapons, their only weakness being magical assaults from Caster units such as the Greyhaven Battlemages of Hernfar Guardians or Blood Sisters of Warband of Scorn. Wraiths can also speed straight through the bodies of other units, floating to the front of a friendly phalanx or slipping through enemy lines in order to attack from the rear. While Heralds of Dreadfall and Terrors of the Mists each contain enough forces to form a complete army of fighting Undead, you can also muster armies composed of units from both Army Pack expansions. Imagine the power of a Banshee supported by Wraiths and Death Knights, or a Barrow Wyrm soaring over a company of Barghests and Bone Horrors. The Undead faction enters the fray with the same variety of deployments as the Daqan or Uthuk Y’llan and with the same vastness of tactical possibilities. Waiqar's army of Undead has risen and are marching towards the ongoing war for Terrinoth. As they draw ever nearer to the battles of the Daqan and Uthuk Y'llan, new forces are joining the fray on both sides of that conflict. The Army Pack expansions Hernfar Guardians and Warband of Scorn are already available, bringing unprecedented might to the Daqan and Uthuk Y’llan factions in advance of the approaching Undead onslaught. Commanders are also harnessing the wild Razorwings, untameable Great Dragon, and hulking Mountain Giant to aid their troops. With so many tactical possibilities for all factions and such savage reinforcements to enlist, there has never been a better time to join in the action of BattleLore Second Edition. Muster armies of vengeful Undead, or devise Daqan and Uthuk Y’llan deployments capable of withstanding the threat emerging from the grave. You are in command. Terrors of the Mists and Heralds of Dreadfall will be available in the third quarter of 2015.